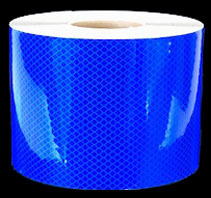 3M 973 Conformable Micro-Prismatic Reflective Tapes are flexible and conformable microprismatic reflective tapes that can be applied to a great variety of surfaces, ranging from hydrants to reflective vehicle stripes, motocycles to helmets. 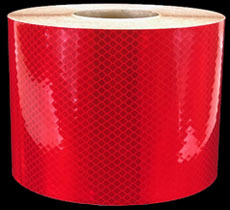 3M 973 is ideal for banding the bonnet edge or barrel of fire hydrants to color code them to flow rate (see rate table at right). 3M 973, when mounted horizontally, offers bright reflectivity even at incident light angles of over 50 degrees. This makes hydrants and vehicles very conspicuous at night when they otherwise could be difficult to see. 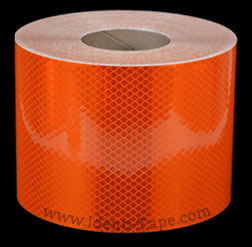 3M 973 has a distinctive diamond pattern, identical to USCGFP, and a highly agressive adhesive. It is flexible enough to be placed around the 90-degree corners of square trail marking stakes and adhere completely. They are an excellent choice for motorcycles saddle bags and flight helmets. It is also great for creating exciting reflective hoops (see some on YouTube). 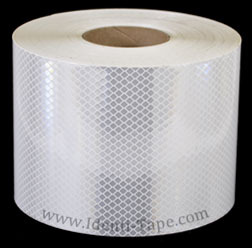 3M 973 is sold here in 15-foot lengths and 55-yard rolls. Approximate thickness is 13-mils (0.013"). A link to 3M 973 specifications is seen here. 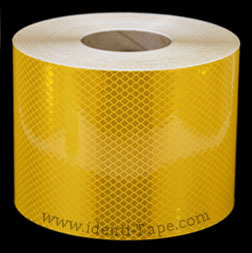 For less expensive tape, see our Engineer Grade tape for hydrants.